(P1) Curry is a very popular dish served and enjoyed globally. According to one British website, about 23 million people regularly eat it. Despite curry’s current popularity, it took a long time for the famous dish to spread around the globe and become renowned. 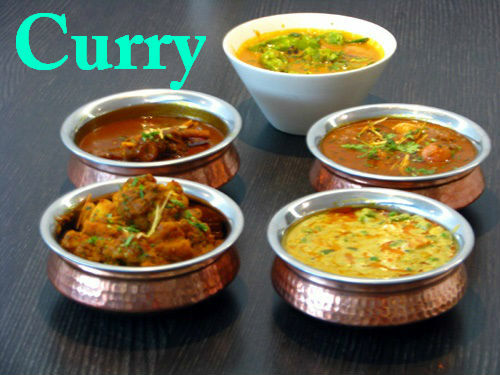 (P2) Historians have traced the origins of curry to the pre-historic era in what is now known as India. At this time, curry was a mix of seeds that were mixed together and ground into a fine powder. It was used very much like salt and sprinkled on other food to give it additional flavor. Curry then spread to other Asian countries. In the mid-17th century, British traders became acquainted with the dish and its popularity took off. As curry restaurants were opened in different countries and traders brought the dishes to far-off and exotic places, curry became a hit in most parts of the world. Despite the worldwide curry craze, however, there is great regional variation in terms of the ingredients and preparation of curry. (P3) In Asia, for example, curry is generally milder in flavor than in other parts of the world. Potatoes and meat are usually used in the curry and it is usually served alongside rice. It is common in China for curry to be cooked with fish with green peppers, onions, and potatoes. The result is a mild yellow curry sauce. Diners may add soy sauce or chili oil to bring out the flavor. Japan, meanwhile, considers curry to be a kind of stew often made using meat, onions, carrots, and potatoes and served with pickled vegetables. (P4) In Britain, curry is synonymous with a dish called “Chicken Tikka Masala”. This is a curry dish that was brought to English restaurants long ago and tweaked from the original Indian curry recipe to suit British tastes. This refers to roasted pieces of chicken that are soaked in yogurt and baked in an oven. The chicken is then served with a spicy sauce that may include tomatoes and coconut cream. This style of curry is so popular among Britons that one politician declared it the British national dish in 2001. (P5) South Africans have long embraced curry, which was introduced there by Indians over 250 years ago. The local variant is often called “Durban Curry”, which is red hot in flavor as it uses cayenne pepper and chili. Garlic and ginger are added to fried onions topped with chili powder. Other ingredients may include cinnamon and coriander. The dish is commonly served with rice and might include chicken or fish although most Durban Curry lovers seem to prefer lamb with it. Do you like to eat curry dishes? Why or why not? Are curry dishes popular in your country? If so, how are they prepared and cooked? What are some other food dishes you enjoy eating? When did the British become aware of curry? When did Great Britan proclaim curry as a national dish of their country?